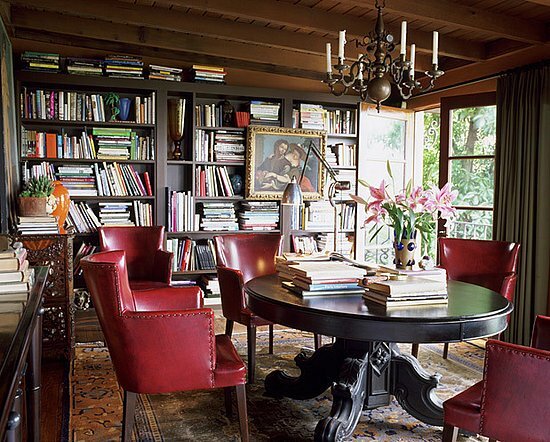 Library Carpets: Persian Rugs Make Your Home Library a Comfortable Space! This is a great blog entry we came across on the Internet. It's called "Get the Look: Timeless Library" on casasugar.com. We have to agree! And the rug beneath that table appears to be a very unique Antique Persian (possibly Bijdar or more likely, a tabriz) carpet. One of the greatest elements to add to a Library the sophisticated luxury of antique oriental carpet. So what are some of the more common library rugs? More popular library carpets tend to have repeat patterns in the field such as bokhara designs, Bidjars, and Shiraz. Other rugs which tend to have that striking look of rich colors and depth include Sultanabads, Tabriz, Heriz and american sarouks (vintage 1920's). While many of these rugs can be found in newer versions, investment range can vary from very low to extremely high. Take a look at some of these great candidates for Library Rugs! * Image above: Antique Bidjar, 8ft. 1in.x 11ft. 8in. Third Quarter 19th century. Photograph as seen on Claremont Rug Company's Internet Gallery. * Image above: Semi-Antique American Sarouk, approximately 9ft. x 12 ft. Circa 1930. Photograph as seen on Dilmaghani's Rug Database. * Image above: Sotheby's lot 198 sale N07852. Antique Bidjar Carpet, 8ft.2in. x 12 ft. Circa 1900. Photograph as seen on the extensive database of SpongoBongo for Oriental Rugs and Persian Carpets. * Image above: Semi-Antique Shiraz Carpet, 13ft. x 27 ft. 9in. Circa 1935. Photograph as seen on Rug Rag. * Image above: Antique Ferahan Sarouk, 9ft. x 11ft. 6 in. Circa 1875. Photograph as seen on Claremont Rug Company.